I've been in a sewing black hole. There are loads of things I want to sew. I've even traced out patterns. I've washed and catalogued all my fabrics (way too many of them!). My sewing machine has been sitting on the dining table, making me feel guilty. So why haven't I been sewing? I don't know. To be fair, I haven’t done much cooking or photography lately, either. Maybe it's just a general mid-winter malaise. I think I need a holiday! Last night, however, was different. I got very... focused. 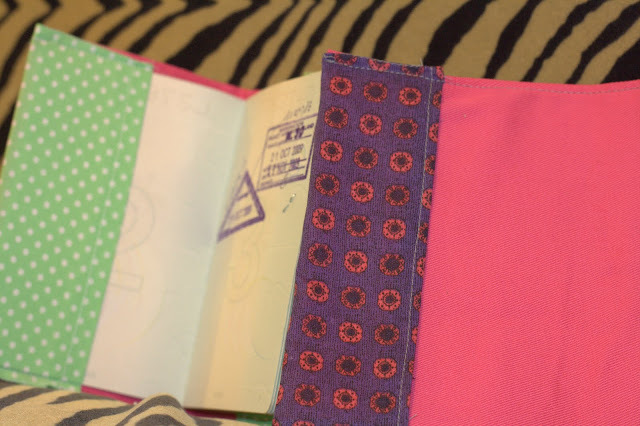 I'd seen these pretty fabric passport covers, and figured I could make one. The first one was a bit rubbish – I chose a fabric that was too flimsy, though pretty. Then I made one I was happy with. Then I made another. Then I had some food. Then I cut out some more. Then I ironed another to sew later. Now I'm thinking about making a little wallet for my camera's SD cards. I plan to buy a bunch more when I'm on holidays, as I don't know how much computer access I will have. What is with all this sudden productivity?? It's certainly not normal. And what on earth am I going to do with all these passport holders? I can only have two passports. Also, I've made the covers in fairly girly fabric, so I really don't think Chris will want one. I'm leaning towards making a whole heap (setting it up production-line style is efficient). Then maybe I could open an Etsy store – also on my Day Zero list. There are already a few stores selling similar items. HOWEVER. The ones for sale at the price range I would target... they aren't necessarily very good. Lots of them are just clear vinyl covers with a piece of fabric inserted. Others have wonky stitching. Still more are poorly cut and ironed, so they are funny-shaped. I think I can do better. And there seems to be a complete hole in the marketplace for memory card cases. The only ones I can find on the internet are either ugly plastic things, or expensive leather things. Mine would fit somewhere in the middle. The nice thing is, I don't have to set myself up as a business in NZ unless I'm selling more than $60k per year of goods. And that would be a TRUCKLOAD (or more) of passport holders. So, if this motivation keeps up, maybe I could make myself a little pocket money! Haha, never question productivity! It's the quickest way to end up procrastinating! I love the idea of a passport wallet. Unfortunately my passport barely gets enough excercise as it is!! @Shannon - too true, I should just make the most of this crazy burst of energy! @Kirsti - those are the ONLY PASSPORT STAMPS I HAVE EVER HAD! In nearly 28 years of travelling between here and Australia, I never got a stamp. Apparently it's because Australians don't need a visa to travel here, but Kiwis *do* get a visa when they enter Australia. 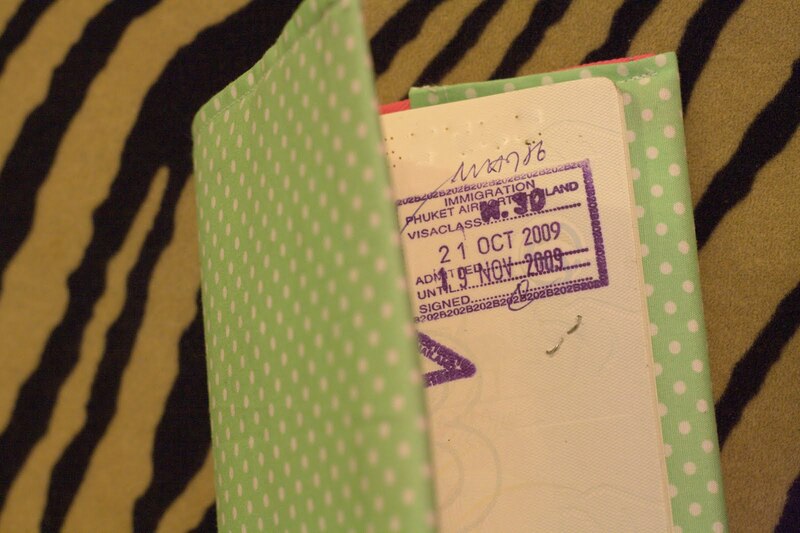 Also, I don't know what I did with the plastic passport cover. 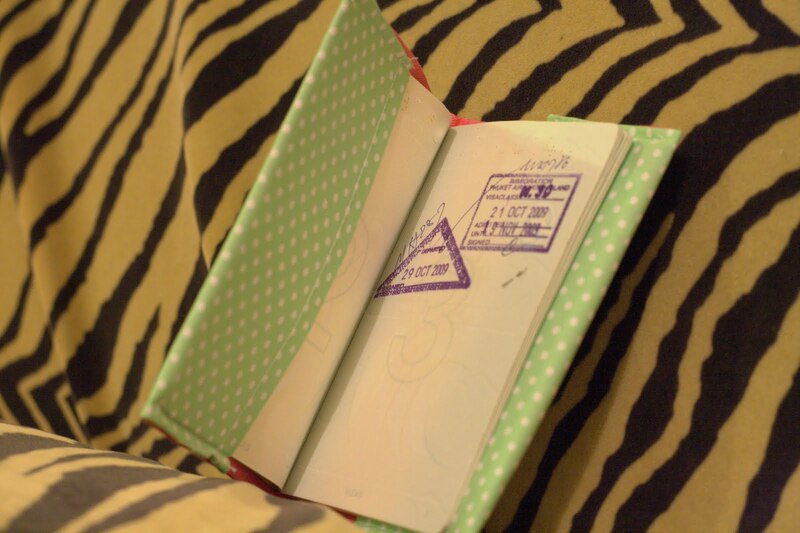 But I have to use my passport regularly to prove my nationality, so it's getting worn out! Ooh, pretty! I've been carrying mine around in an old money belt that has been worn maybe three times in six solid months' travel. I reckon you'll make a killing on these. Mine's been knocking around in my handbag for years and it's starting to look pretty worn (it's only got another year left on it anyway).